The Second Punic War In Italy 213-203 B.C. This is a book that has been sorely needed. We hear about Hannibal's trek to Italy, and across the Alps. This is followed by his first battles culminating in the Battle of Cannae which is usually all we find. The next years from 213-203B.C. are mostly completely glossed over until his return to Africa and loss at Zama. Reading some of the accounts of the Roman generals during this time leaves us in a quandary. Invariably they have Hannibal losing battle after battle with the accumulated losses in the hundreds of thousands. Yet we know this cannot be true. So many losses are patently false, and the cities that went over to him would have switched sides to save their own hides. In actual fact his generalship, while superb in the first years in Italy, put him in the elite of ancient generals. It is the decade of 213-203 B.C. that cements his claim to fame to be the greatest of them. Carthage was no longer a naval power, so the help he received from home was minimal at best. It was his own brain and skills that kept a motley mercenary army together, and dangerous to the very end. In actual fact he was not forced from Italy, but left to deal with Scipio's threat to Carthage. Mr. Roberts cuts through all of the cobwebs and untruths to give us what really happened during all those years. He shows us that the Romans did have their triumphs and successes, but that Hannibal remained a tiger pent up in a smaller and smaller cage. On the Roman side the author shows us the exploits of Gaius Claudius Nero (what an unfortunate name) whose generalship has mostly been forgotten. The book casts a piercing light into a time that is shaded in much shadow. I have read some of the author's earlier works and they, along with this book, makes me hope for many more. 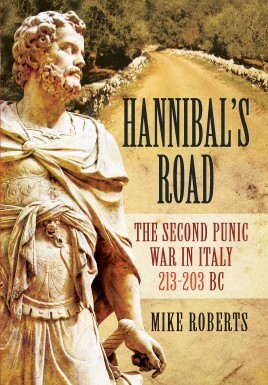 Book: Hannibal's Road The Second Punic War In Italy 213-203B.C.